Ultra HD Forum issues statement on 8K TV | What Hi-Fi? "Our immediate interest is in 4K"
The Ultra HD Forum has issued a statement on the buzz surrounding 8K TV. It says that while 8K resolution is undoubtedly an exciting technology, the association is squarely focussed on 4K for now. The Forum is a global organisation that defines industry best practices for the introduction of technologies to facilitate UHD viewing. Its message? Hold your horses on 8K, for now at least. "8K specifies only a resolution, so as far as the UHD Forum is concerned, it is just another value for the resolution parameter of UHD – just like Frame Rate, which, for example, can be 50, 60, 100 or 120," it says. "Furthermore, 8K is already clearly defined within ITU-R’s UHD-2 specification." It acknowledges 8K TV as "a promising future technology" and plans to include it in its future guidelines (which help industry peeps navigate the choppy UHD waters). It made no mention of the tech when it revised its guidelines last week. The Forum was prompted to issue the statement following the hype already building around 8K. Japanese broadcaster NHK started commercially transmitting an 8K channel at the end of last year. It will also air next year's Tokyo Olympics will be in 8K. An 8K Association was recently formed to promote the technology. UHD Forum president Thierry Fautier added that widespread 8K adoption is a way off yet. "8K is not at the same state of maturity as 4K, and not widely deployable without further development and advances in the ecosystem," he said in a statement. "Our immediate interest is in 4K and HD resolution-based services and technologies, but the Forum continues to monitor the development of 8K video as it may relate to television production and distribution, including leveraging 8K production and display technologies within a 4K distribution system." 8K might be a way off becoming standard, but it's certainly coming, and fast. 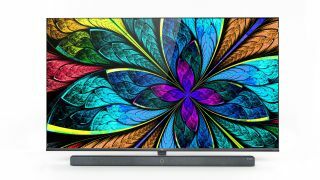 After all, 8K TVs are already finding their way onto shop shelves - just check out our review of the Samsung QE85Q900R. You can read the full Ultra HD Forum statement here.